Multi-reedist Ken Vandermark has been investigating cutting-edge improvisational strategies within a vast array of musical contexts for nearly 30 years now. He’s been a vital link between the Chicago and European improvising communities. In 1999, he was awarded the MacArthur prize for music. 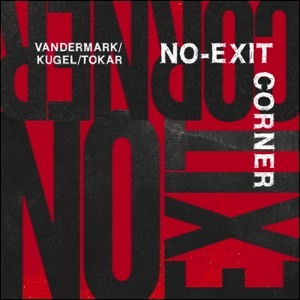 No-Exit Corner, the second CD by the trio featuring the tenor saxophonist and clarinetist Ken Vandermark, the drummer Klaus Kugel, and the bassist Mark Tokar, recorded during a 2016 Krakow club date, is a brilliant example of what I suppose might still be best categorized as free jazz—if only because no one has yet come up with a better name after almost sixty years of trying. For one thing, Vandermark—the trio’s only horn, to whom one’s ears turn first, sheerly out of habit, because that’s how we’ve been taught to listen to jazz—is a Chicagoan, the prime mover in that midwestern American city’s post-AACM ferment. But notwithstanding a few delayed thematic delineations and the frequent chime of Kugel’s cymbals, this music in no way resembles that of the AACM’s first and second waves. It’s not marked by discontinuity, like the music of Evan Parker, the late Derek Bailey, and other early British from-scratch improvisers. Nor does it call to mind Han Bennink or other Dutch dadaists. Peter Brôtzmann might be closer to it, especially on the fast and furious “Left Sided Driver” and the convulsive final few minutes of “Message to the Past,” but not quite. You’ll hear echoes of all these approaches, but only because they’re all part of a common vernacular by this point, and these three musicians are serious students of the jazz past, able to draw from it whatever and whenever they feel need to. Along with being the form of jazz that most prizes individualism, free has also become the most international form of jazz—a beneficial consequence of being the style most independent of the blues (if that’s what a player or group of players choose). 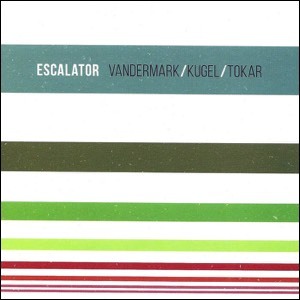 And witness their far-flung discographies, Vandermark, Kugel, and Tokar are committed internationalists. Vandermark, for instance, leads bands based throughout Eastern Europe as well in Chicago, and has lately been collaborating in New York with Jason Moran, another player who doesn’t believe in putting himself or jazz in a box. Tokar has played in Vandermark’s Resonance ensemble, and his and Kugel’s combined discographies include dates with Bobby Few, Roberta Piket, and Charles Gayle, as well as a good number of Eastern Europe’s leading improvisers. Can there be such a thing as straight-ahead free? If so, this disk’s five as-it-happens improvisations would be it. Each achieves something remarkable, a seldom-realized free jazz ideal: the more these players achieve something remarkable, the more these players sacrifice themselves in support of one another, the more our attention is drawn to each’s individual merits. Teasing his solos to climax on the album’s two longest performances, Vandermark shows he knows the difference between repetition and repetitiveness. This might be some of his best playing on records; it’s definitely among his lustiest. Tokar’s “extended” bass technique is astonishing, and worthy of special notice is the way he matches tones with Vandermark when the latter explores the lower reaches of his horn. Kugel is a model drummer, supplying both motion and combustion without so much as implying a steady beat. Only one modifier will do in further categorizing this free jazz: classic.